Discussion in 'Utilities' started by MainMemory, Mar 29, 2011. Those animated mappings have always been a pain to work around; I'm glad to see some effort has finally been pushed to support editing them in the level editor, even if it isn't quite finished yet. SonLVL now has support for displaying (not editing) animated art. 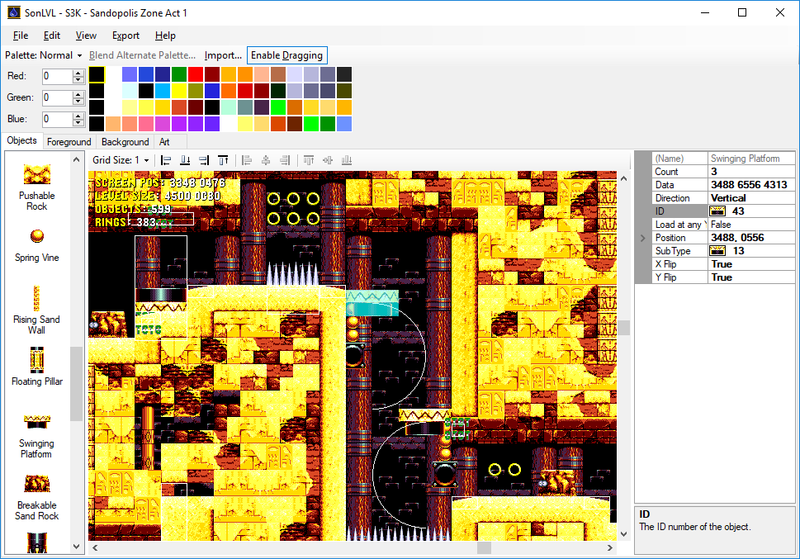 Only Sonic 2 has special block mappings for animated art, and SonLVL does not and cannot edit them. EDIT: I've recently noticed that objects don't render in the foreground layout editor. I could've sworn they did previously; is this some sort of bug? You probably have "Include objects with FG" unchecked. It used to be in the Export menu, but I've moved it to the View menu and made it affect the editor as well as exporting. Roxurface and Pacca like this. Hi, I don't know if this idea has already been proposed or if you plan to do it, but would it be possible to add some kind of visual option to locate unused blocks and tiles more easily? "Delete Unused" seems to be trying to fill that hole. I see where you're coming from though; levels that have object art in the level artwork can't use the Delete Unused feature without damaging the object art, so a way to find unused tiles and pick them out yourself would be nice. Well, the Usage Counts dialog will list unused tiles with a count of 0. I'm editing collision, but can't seem to get my edits to commit, if that makes sense. I know it's saved because I've edited other parts of the layout, and I know it's the right chunk. Any clue why I'm still running into it? That picture isn't terribly informative. As far as I can see, the collision should be saving along with everything else. I have some questions in hand. First one is: Is there any setup guide or specific instructions for the usage of the SonLVL's SonAni tool? I tried to open a animation with this tool a couple times, but I failed in all attempts. I'm really wanting to configure some of my hack's animations in a better and easier way and this makes me really curious to experiment this tool, but I have no idea of how should I start to use it. Second one is: Is there any way of porting solidity from pictures the way it's possible with the art itself or at least to make the editor to auto-setup solidity data when I port blocks from images? There is no specific guide for SonAni, the closest thing is this post that gives an example INI. As for collision, you can provide an image with the same name as your art image with a _col suffix (or _col1 and _col2 for S2/S3K). If you check the "Export art+collision+priority" option in the Export menu and export blocks, chunks, or layout, you can see how it works. EMK-20218 and Calvin like this. There's some sort of issues with object appearances currently. Using the Sonic 1 Hivebrain dissassembly with supplied inis, on most recent versions. I labelled the objects what they should be. A lot of other objects are working fine, but bridges and rings are among the ones that aren't. The S1 2005 object definitions have not been updated to account for the API changes I've made recently, due to other projects taking my time and a general lack of interest. It shouldn't be too difficult to look at the changes that were made to the S1 GitHub object definitions and replicate the changes. So, back near the start of February, Fred (Neo on Sonic Retro) contacted me to work on improving the object definitions for the S3K GitHub disassembly, the development of which has required me to add several new features to SonLVL, and 8 months later, nearly every single object in S3K's levels has a proper definition with properties, graphics, and even overlays showing movement and boundaries. This takes S3K from being the least complete of the main three to being the most complete. KCEXE, TheInvisibleSun, nineko and 12 others like this. Is this going to be implemented to Sonic 1 by any chance? Not by him, and probably not by me either. If you're volunteering though, you have my full support. EMK-20218 and TheInvisibleSun like this.